Genesis Footer Builder allows you to customize the site footer just as you want. This plugin works exclusively with Genesis framework. The plugin also allows you to add a footer menu to the site. So just in case your theme doesn’t provide the support for footer menu, this plugin comes in handy for adding some useful links like Home, About Us, Contact Us, Sitemap etc in the footer. You can configure the options and go with the plugin default credits text or you can completely customize it using the Custom Footer Copyrights text-area in the plugin. The Custom Footer Copyrights text-area allows you to use HTML tags, entities and shortcodes. Along with Genesis shortcodes, you can use your own custom defined shortcodes as well. In addition to this, Genesis Footer Builder also provides a set of shortcodes for each of the options you set-up in the plugin. Specify custom brand name for use in the footer credits, which otherwise defaults to the site title. Specify the copyright year or duration to be included in the copyright notice. Defaults to current year. Customize the footer credits text completely (in case the plugin’s default credits text doesn’t work for you). Set-up and display a footer menu on the site. 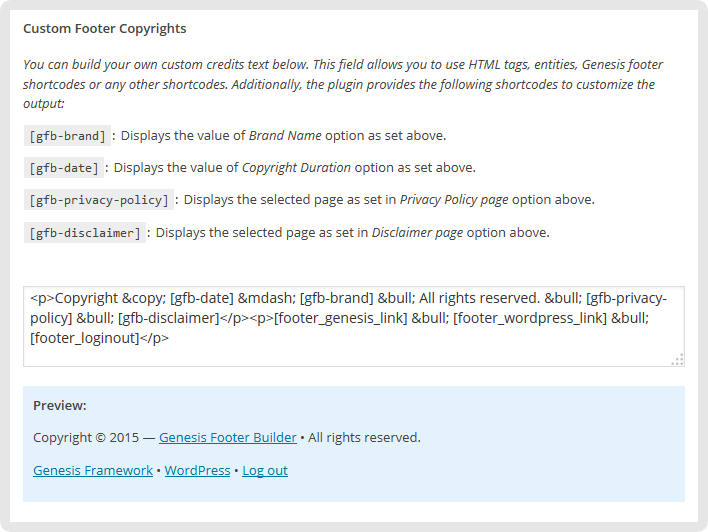 Genesis Footer Builder offers various shortcodes for using the options that you set-up on the settings page. Now, when you want to set-up your own custom credits text, you can use the following shortcodes in the Custom Footer Copyrights area. [gfb-brand]: For displaying the value of Brand Name option on the plugin’s settings page. 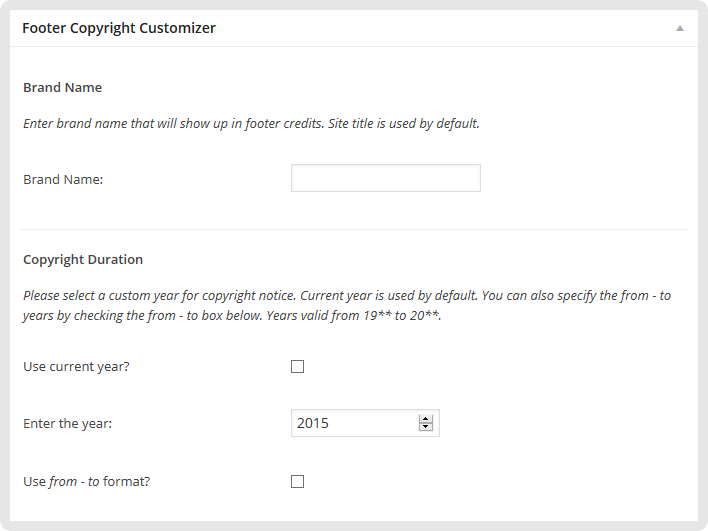 [gfb-date]: For displaying the value of Copyright Duration option on the plugin’s settings page. [gfb-disclaimer]: For displaying the selected page as set in Disclaimer page option on the plugin’s settings page. It’s fairly simple and easy to configure the plugin and see your site footer shaping without additional effort. In case you have any issues, visit the support forum and we will help you out. Thank you for using Genesis Footer Builder!